The principal at Cummings elementary school had a message for the Keizer Traffic Safety Bikeways and Pedestrian Committee Thursday, April 13: prioritize pedestrian access around her school. Mangan brought an ally with her to the meeting, Carol Doerfler, a member of the West Keizer Neighborhood Association Board and crossing guard at the school. Doerfler didn’t mince words. “When I am there watching the kids run back and forth along the edge of the street, it is enough to give you heart failure,” Doerfler said. Currently, the only available sidewalk around Cummings, on Delight Street N., end at the building itself. There are no sidewalks on the opposite side of Delight and none along Cummings Lane North. The project has been on the city’s wish list for at least a decade, but finding funding for it has been more of a challenge. The city applied for federal funds to install sidewalks and other pedestrian improvements around 2008, but the project was scored so low by grant administrators that the city hasn’t even attempted it again. “Arterials and collectors get most of the federal funding and (Delight) is a local road,” said Bill Lawyer, Keizer Public Works director. While the city’s street fund is one of the more solvent funds in the city’s budget, Lawyer said previous commitments have a priority in the immediate future. This summer, the city is replacing the bridge on Dearborn Avenue Northeast. After that, the city is on the hook for a portion of the funding to install a new traffic signal at the transit center in Keizer station. “Realistically, the soonest we can get to it would be during the 2018-19 fiscal year,” Lawyer said. He’s hoping to have a clearer picture in the next six months as the plans at the transit center are fleshed out. In the interim, Mangan has asked the Salem-Keizer School District to help alleviate the situation. Mangan said the school district plans to have a gravel path installed inside the fence around the field to the north of the school. She hopes it will keep students within the fence and not walking around cars that park outside of it. “At least with that, students can be safe until they reach Evans (Street North),” Mangan said. Cummings has about 440 students and only 50 take a bus to and from school. Mangan said she encourages families that live within a mile of the campus to walk, but there are a significant number that are brought to and from school in personal cars. 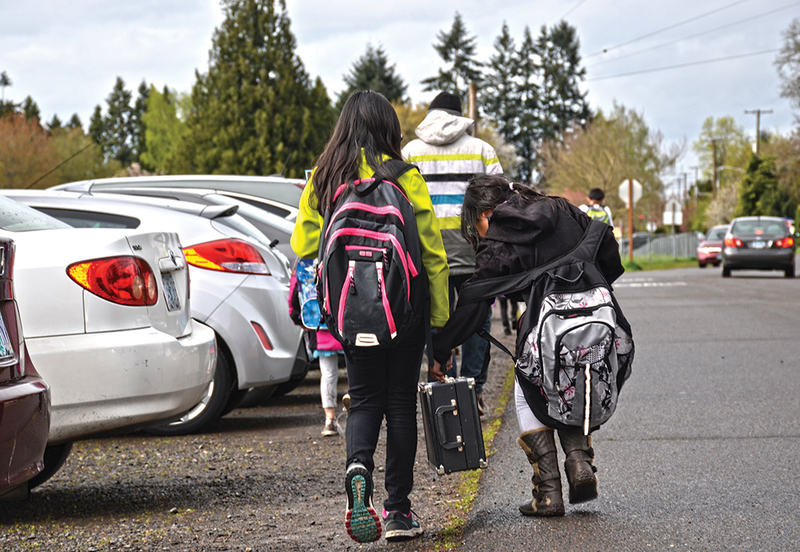 If parents drive their students, the school encourages them to pick-up and drop-off behind the school building, but compliance is not mandatory. Acknowledging that the project has been long-considered at the city level, Kathy Lincoln, a member of the traffic safety committee, said the involvement of the school district could be beneficial. “If we can get some cooperation and investment from the school district, it might help the process along,” Lincoln said.